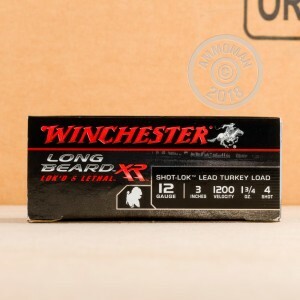 Winchester Long Beard XR is a high-performance choice for avid turkey hunters. 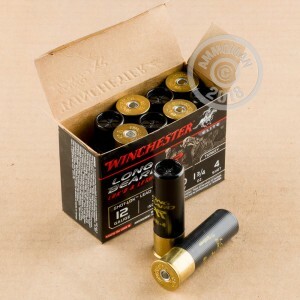 These 12 gauge shells use a 3" hull length to accommodate a 1-3/4 oz. shot column. Each shell produces a muzzle velocity of 1,200 feet per second. Long Beard XR shells feature Shot-Lok technology, which consists of a resin buffer poured into the shell to protect the pellets. When the shell is fired, the resin breaks apart instantly and provides a high quality buffer that prevents shot deformation and results in massively improved accuracy at 60 yards. This effectively extends the range of the shell well beyond many conventional turkey loads! 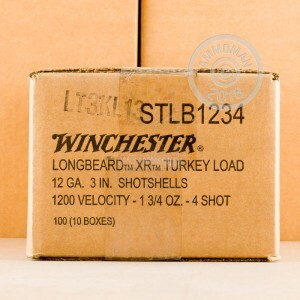 This ammunition is loaded in Oxford, Mississippi and comes in boxes of 10.